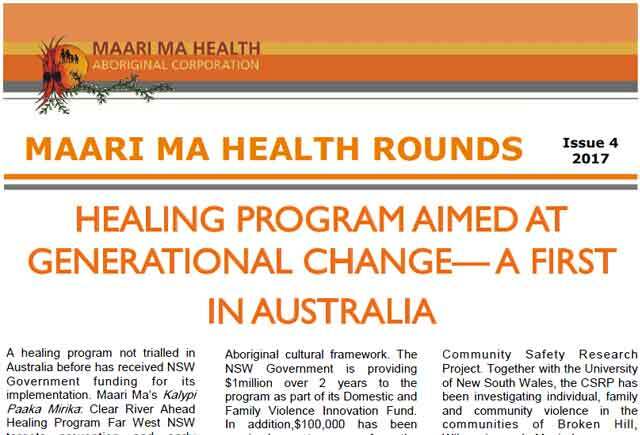 Issue 4 of our newsletter has all the latest on Healing Program Aimed at Generational Change, Maari Ma on show for NSW Australians of the Year, Marrabinya - Efficient and Effective, Raising Awareness on White Ribbon, Continuity of Care and Celebrating NAIDOC. 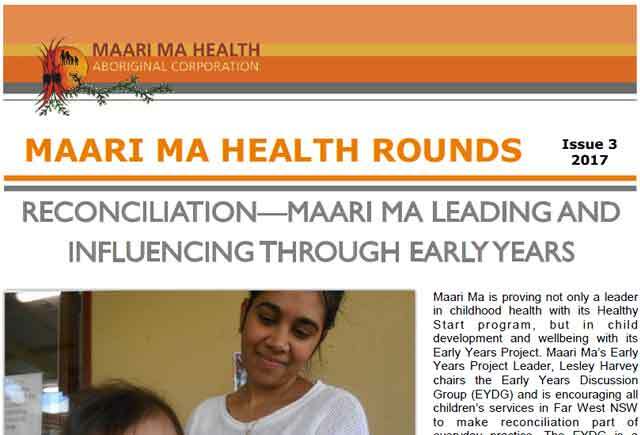 For issue 3 our newsletter has stories on Reconciliation, Maari Ma Early Years Project, Employer of Choice, World No Tobacco Day, Maari Ma Congratulated New Head of Murdi Paaki, Second Registrar to Qualify as GP, Nutrition Education and Working with Contarf. 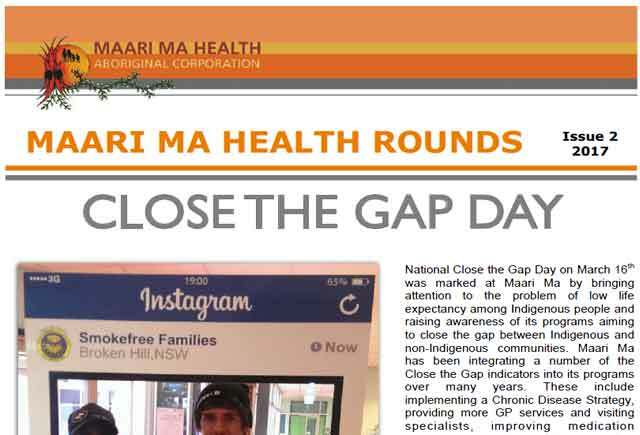 The second issue of Maari Ma Health Rounds features Close The Gap Day, Marrabinya - Making a difference, Youth Health, Using Social Media, Extra Dental Services for Maari Ma clients, Close The Gap Day - Wilcannia and Quality Improvement. 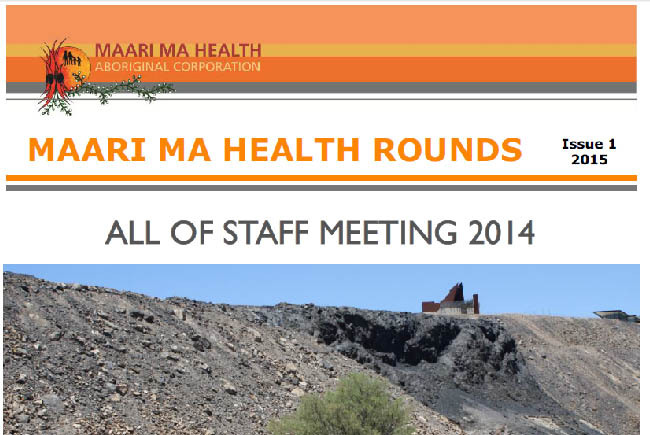 The first issue of 2017 features articles on our All of Staff Meeting 2016, Snapshot of 2016, Re-Accreditation, Achievements Recognised, Celebrating the Next Generation, Justice Health Partnerships, Human Rights and Maari Ma Congratulates Murdi Paaki. 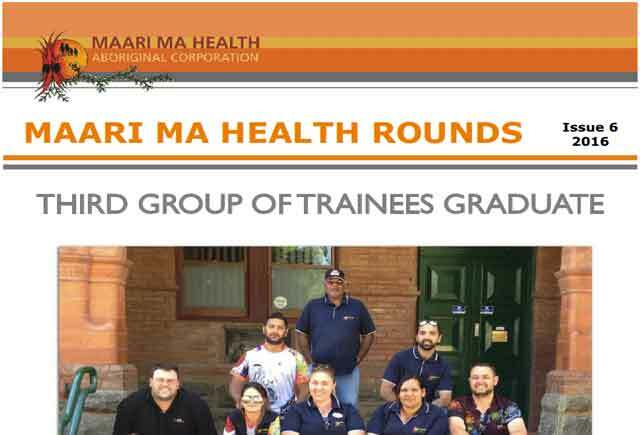 Issue 6 of the Health Rounds newsletter features Trainees Graduation, New Lead Guidelines, Marrabinya - Indigenous Health Support, Registrar Training, White Ribbon Day and Christmas fun for HIPPY children. 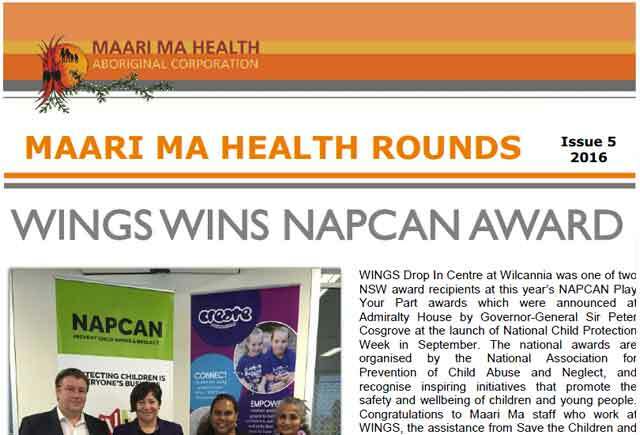 For issue five we bring news on WINGS winning the NAPCAN award, Maari Ma being a finalist in the National HR awards, Clinical Education, our evening Specialist Clinic, Women's Health Day, Dental re-accreditation, Tackling Indigenous Smoking, and International Day of the World's Indigenous Peoples. 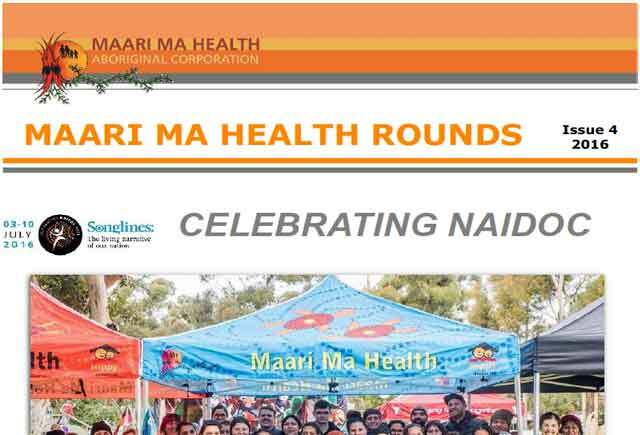 Our fourth issue features news about Celebrating NAIDOC, Maari Ma at the United Nations, Going Mobile for Fluvax, International Focus, Active Kids and the Gala Community Event in Wilcannia. 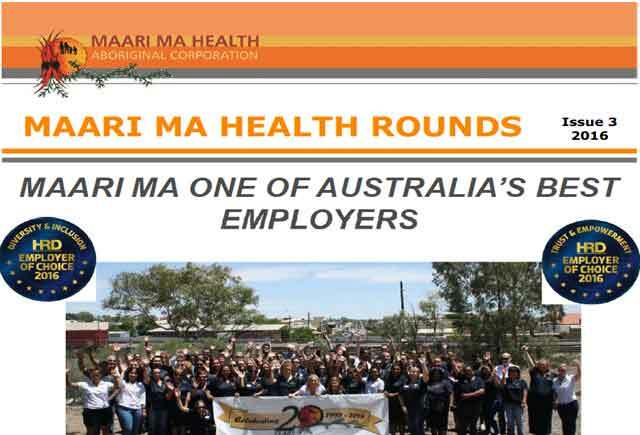 Issue 3 features news about the Employer of Choice Awards, the Environmental Health Unit, the National Best Practice Unit, Maari Ma's Partnership with the Clontarf Foundation, the ‘Getting It Right’ study on Depression, Tamara Jones' Bachelor of Midwifery through Southern Cross University, Polynesian Dance Classes at WINGS and Wilcannia’s Community Dinners. 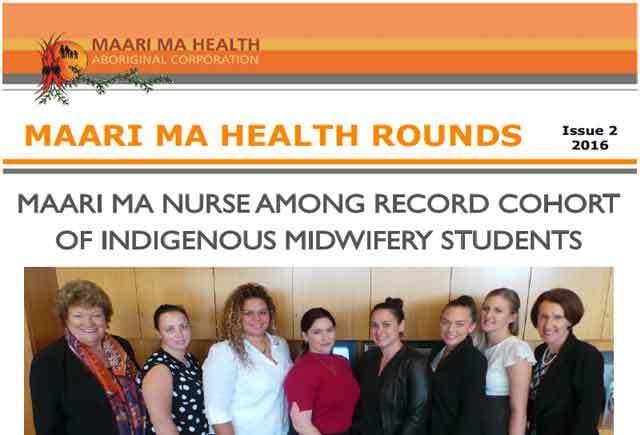 Our second issue of the 2016 Health Rounds newsletter features news about our midwifery student nurses, the first PHN in Australia to establish an Aboriginal Health Council, our new Lead program, Maari Ma’s annual “Close the Gap” event, further education at Macquarie University, a new site for Maari Ma’s Playgroup, and “Got my check, just for the health of it !”. 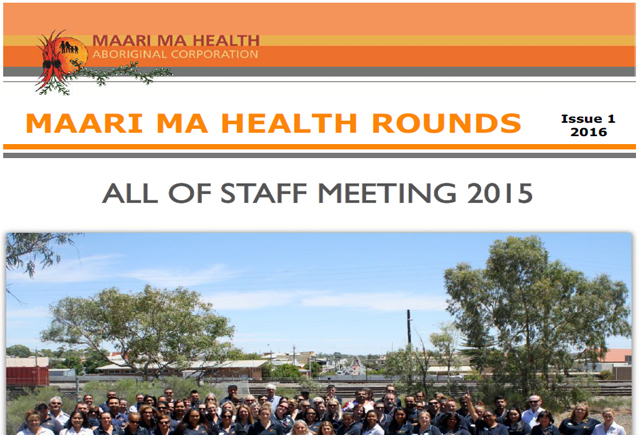 The first issue of the 2016 Health Rounds newsletter features news about our All of Staff Meeting, Workforce Development, Healthy Start, Early Years, Practice Administration, and our GP Trainee Program. 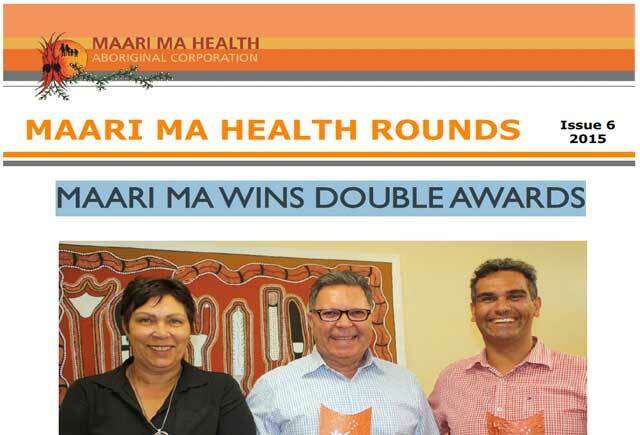 The sixth issue of the 2015 Health Rounds newsletter features news about Far West NSW Business Awards, White Ribbon Accreditation, State recognition for WINGS, HIPPY Graduation, youth health, and getting into the Christmas spirit! 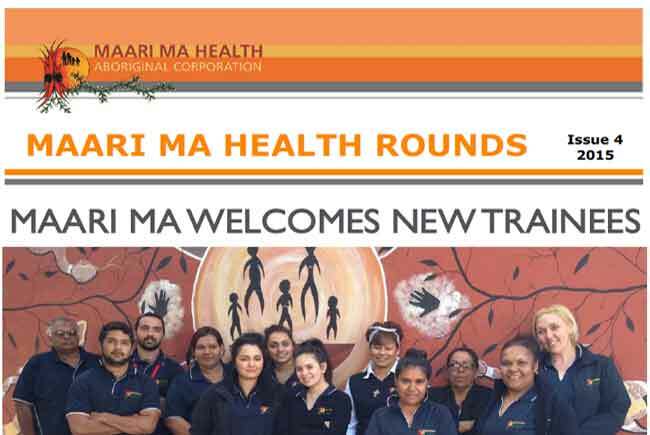 Our fourth issue of the 2015 Health Rounds newsletter features news about our new trainees, the 20-year celebrations, articles on dental health, the youth health program, white ribbon night and NAIDOC 2015. 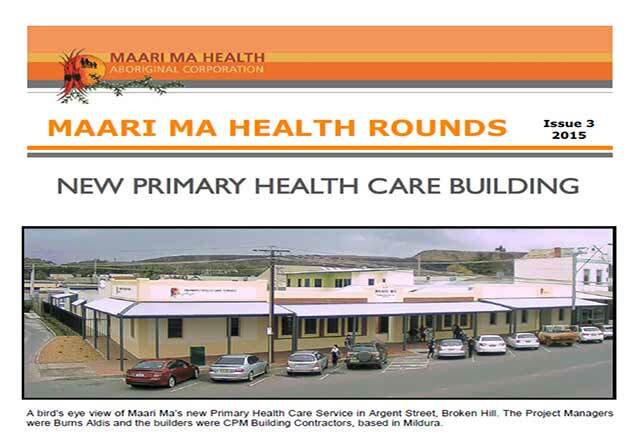 The third issue of the 2015 Health Rounds newsletter features information about the new Primary Health Care building, Service Delivery, justice health agreement, staff updates, early years, and Wellbeing Framework publishing. 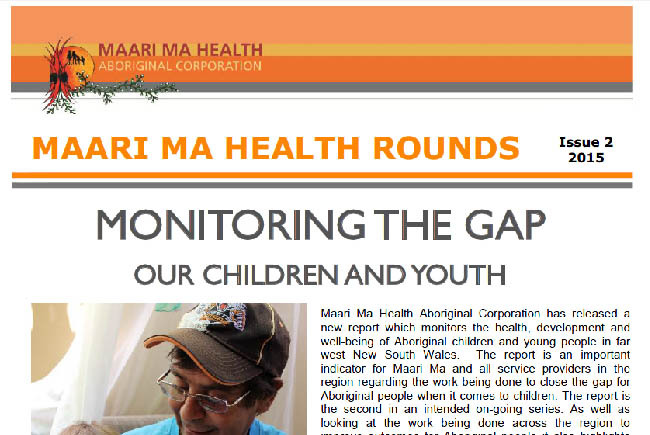 Issue 2 of the Health Rounds features articles on our children and youth, education from the experts, innovative numeracy research project, white ribbon accreditation, working with school students, and Close the Gap Day 2015. 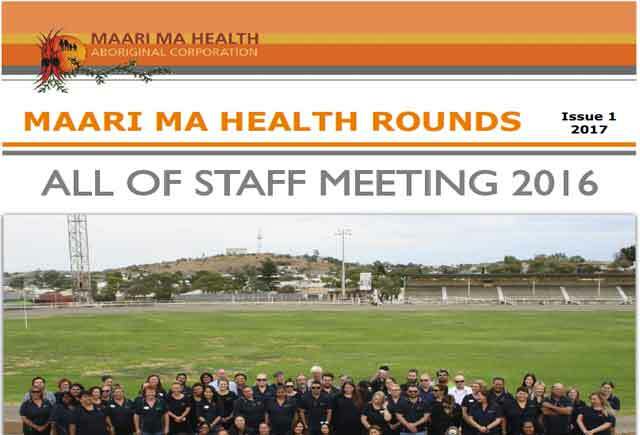 The 2015 first issue of the Maari Ma Health Rounds features stories on the All of Staff Meeting 2014, Workforce Development, recognising long service, Wilcannia Health Service, and the new Primary health Care Service building in Broken Hill. 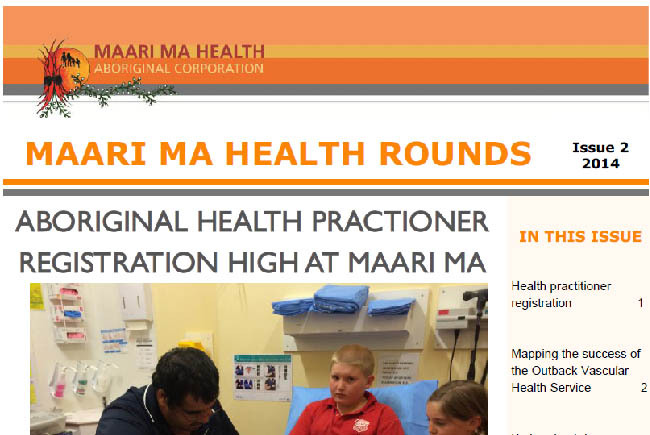 Maari Ma Health Rounds issue 5 features stories about Preparing for the transition from Medicare Locals to Primary Health Networks, the good progress on PHCS re-development, record breaking school holiday program at WINGS, Maari Ma winning the child protection award, HIPPY Tutors, Talent shows for Mental Health Month, and the Children’s Week excursion. 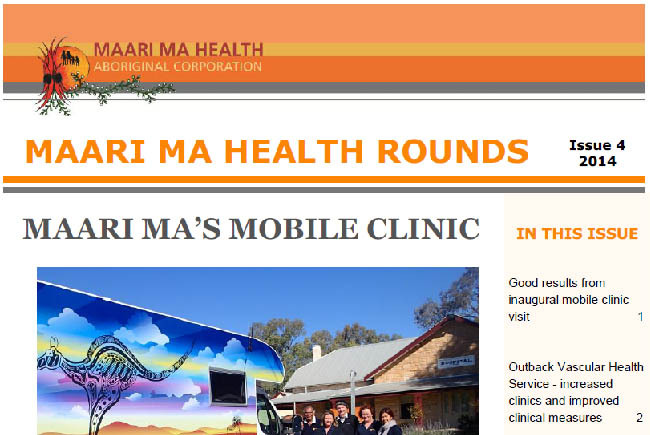 For issue 4 of the Maari Ma Health Rounds we feature stories on Maari Ma's mobile clinic, Outback Vascular Health Service - increased clinics and improved clinical measures, Maari Ma joining the White Ribbon campaign to end violence against women, After School Cooking Classes — gaining valuable skills at an early ages, and Celebrating NAIDOC. 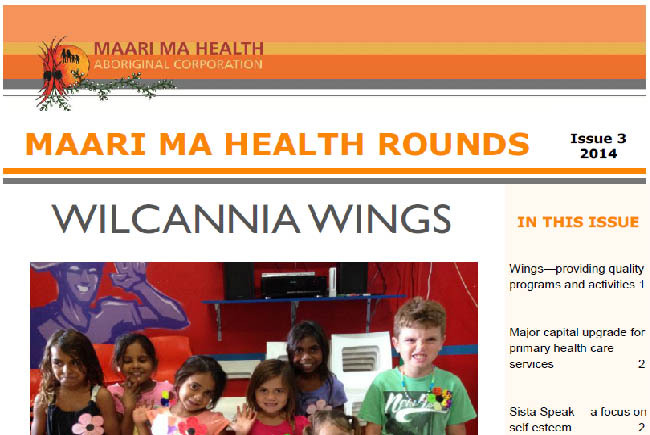 Our third issue of the Maari Ma Health Rounds details articles on Wings—providing quality programs and activities, Major capital upgrade for primary health care services, Sista Speak— a focus on self esteem, the Stand-out clinic van for Wilcannia, Menindee wins state-wide weight challenge, Tempting young taste buds, and Relocation information. 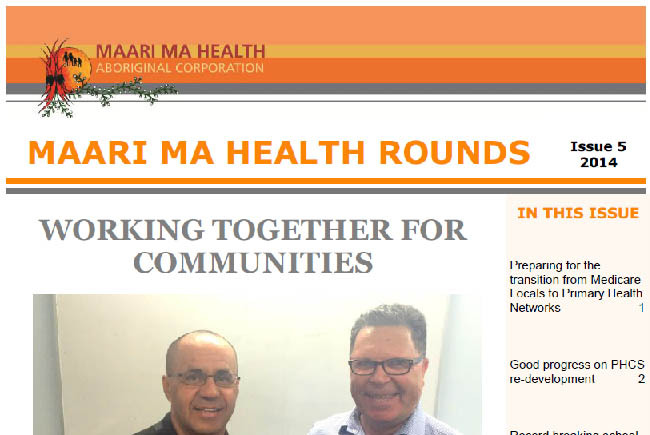 Issue 2 of the Health Rounds features articles on Aboriginal health practitioner registrations, Mapping the success of the Outback Vascular Health Service, Diet and nutrition promotion in clinical outreach, Engaging the local art community for health promotions, and Raising awareness during Close the Gap Day. 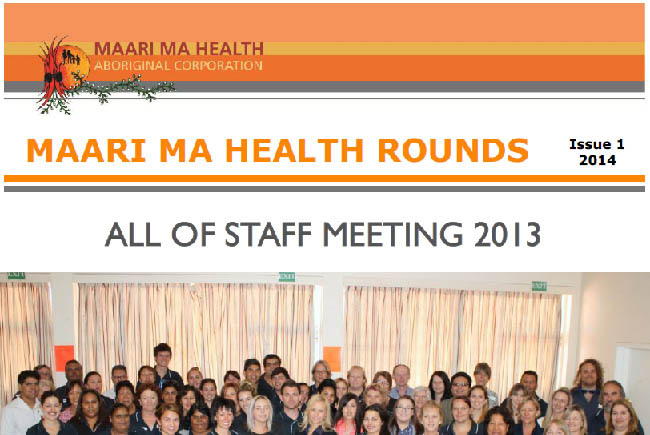 The 2014 first issue of the Maari Ma Health Rounds features stories on the All of Staff Meeting 2013, Workforce Development, Primary health Care, WINGS, and the Community Safety Research Project.